As we have finally fixed most of our problems with IDEs and OS versions, we can shift our focus to other Android problems. IMHO, the most important problem is the core problem of Android development - Java. Sorry, Java Harmony. 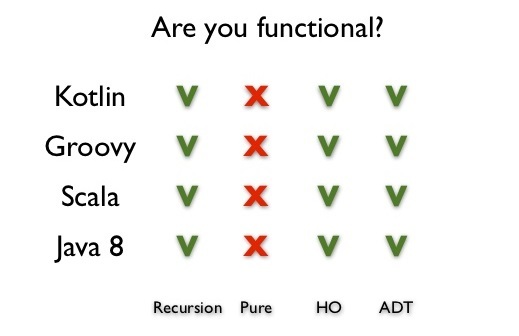 Which is basically Java 7. 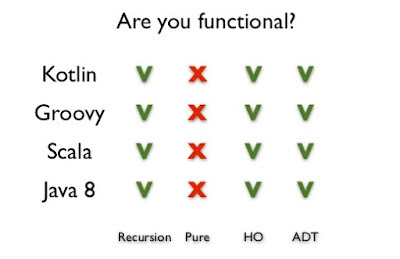 Or Java 6. But is not Java. Don’t get me wrong - I strongly believe that Java is a good programming language, but I also think that it’s the right time to think outside of the box. We need to start looking for other programming languages that will replace Java as the primary language for Android development. Just look at our most important competitor - Apple. They have introduced a completely new language called Swift which combines the best features of several other languages (like Python, Ruby or C#). We already need considerably more time than iOS developers to develop the same app, and now we'll be even slower. (Jake Wharton recently wrote a great overview of Kotlin for Android)? I would also like to point out one more problem - database management API. If you commit blasphemy once again and look at our competitors - iOS (Core Data, to be more precise) - you'll see that they have nice methods and GUI for creating database objects, CRUD methods, database change listeners. But if you look at the default Android API - we still haven't gotten far from writing SQL commands which greatly affects our development process. (like GreenDAO, ActiveAndroid or SugarORM), they all have their own problems. I have never been completely satisfied with them - they have been either complex to use or something has been missing (like database change listeners). My mind is set on Realm for Android and DBFlow, which I'm hoping will solve all of my problems and will also have shorter execution times. A lot has changed in the past few years for Android. It has evolved from a simple OS for smartphones and is now powering many other devices. Time will tell what will become of it. Who knows, maybe we'll even program nuclear fusion reactors with it.